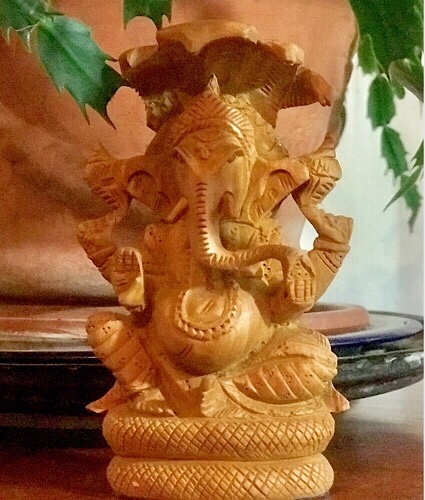 A couple of weeks ago, I found a carved wood murti of Ganesha in a box on the sidewalk with some other stuff and a “free” sign. This Ganesha had serpents (nagas) rising over his head like a canopy–not uncommon imagery. Ganesha was “free” most likely because one of the nagas had broken off. It made me think of Ayyappa, Ganesha’s brother by a different mother. Ayyappa is apart from the others. Of Shiva’s three sons, he is the one who is either or both missing or extra. The trunk was also badly glued, but that can be remedied.